Having a wealth of experience in residential and commercial sales and lettings, residential/commercial property management and a range of other professional services including RICS Home Buyer Surveys and Valuations, Commercial Valuations, Rent Reviews and Lease Renewals under the Landlord and Tenant Act 1954 (as amended), Valuations under the Leasehold Reform Act 1967 (as amended) and legislation relating to flats and apartments. The principal, Graham Morris, FRICS, joined the practice in 1965 and has undertaken professional work in and around South Wales throughout his career. Clients can be assured of personal service from the experienced principal and staff, all of whom have been with the practice for many years. 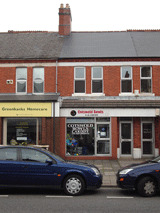 A fully independent Chartered Surveyors Practice established over 50 years ago and recently relocated from Cardiff's City Centre to Whitchurch Road, an established City suburb. Being Chartered Surveyors in Cardiff, and members of the Independent Surveyors Association, clients can be assured of independent and professional advice. You will be in safe hands when instructing HJF & Co who maintain a Complaints Handling Procedure (details of which are available upon request).